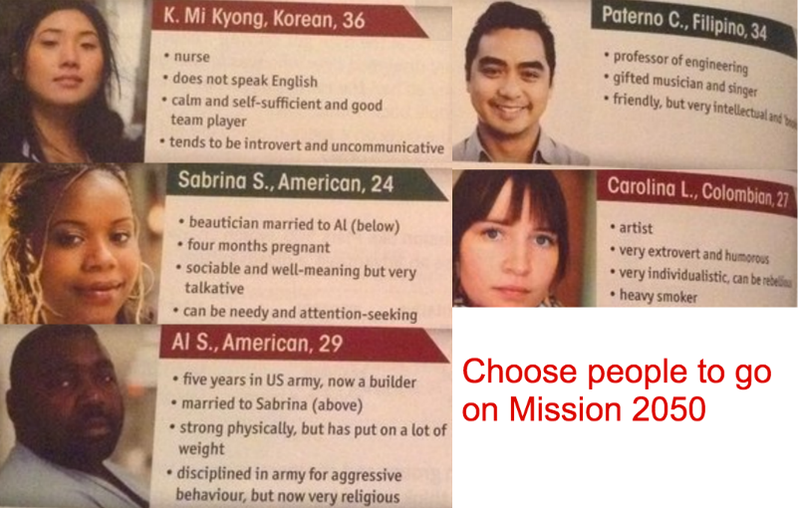 The idea of the class on March 26, 2016 in online English school amilingo.com was to pick the members of the crew for the mission to the future space traveling. We chose K.Mi Kyong, Paterno C. and Carolina L. because we didn't want to split the couple (Sabrina and Al) or combine them with another person. Next unexpected result was that the qualities of characters which we had chosen in the first part of the class didn’t match with characteristics of real chosen people. Probably the reason is that we tend to use intuition rather than logic.